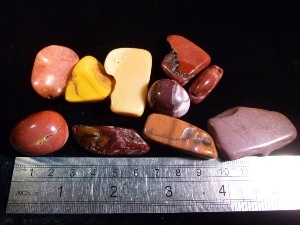 Mookaite is a patterned red and cream variety of Jasper, you may see various spellings of this name. Found in Mooka Creek, in the Kennedy Ranges in the Cararvon Basion, Western Australia. The word "Mooka" is a Aboriginal word which means "running waters” as many fresh water springs feed into to Mooka Creek. 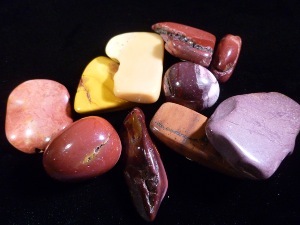 Mookaite is said to be good for people who are making decisions and seeking creativity and new perceptions, ideas or work providing a useful balance. May also help childminders and mothers who need to cope with children and their inventive minds. Physically good for weight loss and the health of stomach and thyroid glands. May help with a hernia or water retention, along with fortifying the immune system. Emotional and spiritual said to be good for grounding, dreams, moving forward in life and building self-esteem. Said to help with fear and depression. Aids meditation. Moonkaite Jasper from Australia tumbled to a smooth finish, an ideal pocket size stone, small enough to carry around with you. Tumble Stones can also be placed around the home for their energies or can just be nice decorative items. A Moonkaite Japser crystal gemstone of varying sizes selected specially for your order.